Rudi Koertzen, before his last spell as an international umpire, is told by colleague and match referee Chris Broad that a flight has been found to get him home two days early but it will be economy class. The answer from the South African is negative. Home will have to wait just a bit longer. His 108th and final Test, between Pakistan and Australia at Headingley, finished almost two days early and Koertzen was keen to start a new domesticated life rather than spend more time in a hotel room. 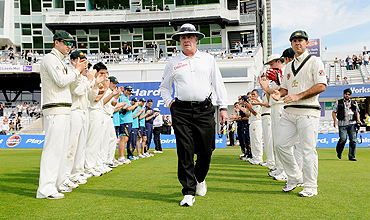 "The guys asked me what I'm going to do now and I said I'm going to start working on my marriage after 40 years," the 61-year-old said with a chuckle, minutes before he was given a guard of honour by Australia's team. "My wife (Hyla) has been everything. While I have been travelling she has been the housewife, the maid, the gardener, if we are doing renovations to the house she will take charge and make all the arrangements and I'm very thankful to her." Koertzen, famous for his 'slow death' raising of his arm when giving batsmen out, will return to the small town of Despatch (about 20 miles from Port Elizabeth) for a more sedate lifestyle not involving airports and hotels as a weekly routine. With two daughters and two sons - only one son remains at home - Koertzen is a proud family man. "They have followed my career with a passion and they eat, drink and sleep cricket," he added. "Whenever I go home there is always a television on and someone will be watching cricket." Koertzen also stood in 209 One-Day Internationals, making him the most experienced umpire in that format, while he is second to Steve Bucknor on the Test appearances list. He made his international debut in a One-day game between South Africa and India in 1992 at Port Elizabeth and has since witnessed significant change, with his decisions now scrutinised by an array of televisual aids. Koertzen said he tried to avoid watching match highlights after a day's work. "It is hard with technology and you are not going to get away with anything now," he said. "It's there and will probably get worse so to be successful in this game you just have to be more alert and get your decisions right. "I do come from the old school when there wasn't scrutiny like today. If I sat back and thought about it maybe I would decide it's good that I am going." Koertzen's highlight was appearing in the opening game of the 1999 World Cup at Lord's. His worst low was not the 2007 World Cup final when he was involved in a farcical mistake that cost him an appearance in the Twenty20 World Cup later that year, but during an Ashes encounter between England and Australia. "The hardest cricket in the world to do is the Ashes because of the way the guys play and with all the hype around it," Koertzen said. "In the Melbourne Test in 2006 I didn't have a good game at all and the ball was swinging all over the place. "I walked on to the ground and felt claustrophobic because for me it's a football field, it's not a cricket ground. I struggled for the whole match. "I struggled with lbws - when I thought they were pitching outside leg they were in line." The one player he singled out as the finest and most challenging to umpire was former Australia leg-spinner Shane Warne. "As an umpire you needed hair on your chest to survive him," said Koertzen. 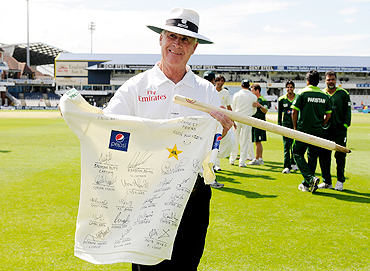 "Every ball he bowled in his opinion was a potential wicket and he wasn't far wrong," said the veteran official. "He would ask you questions like 'where was that going?' or 'was it too high?' I said to him I am not here to coach you. You make the appeal and I will make the decision." Koertzen's pressing challenges now are eyeing up antelope when he goes on a game drive, improving his golf and hooking some fish. "I have a nice 21-foot cabin boat that I cannot wait to go out fishing on," he said. "I will also play some golf and see if I can get my handicap to a single figure. I'm playing off 11 at the moment but it's not the best 11." With that, he carried his folded umpiring shirt in a brown paper bag into the officials' room and prepared for his swansong.